MCTA staff can be reached between 8:00 AM and 4:30 PM Monday through Friday. MCTA is centrally located in Monroe County, right along PA 611 north of Tannersville. MCTA began regular bus service on Monday, October 15, 1979. Agency staff can be reached between 8:00 AM and 4:30 PM Monday through Friday. 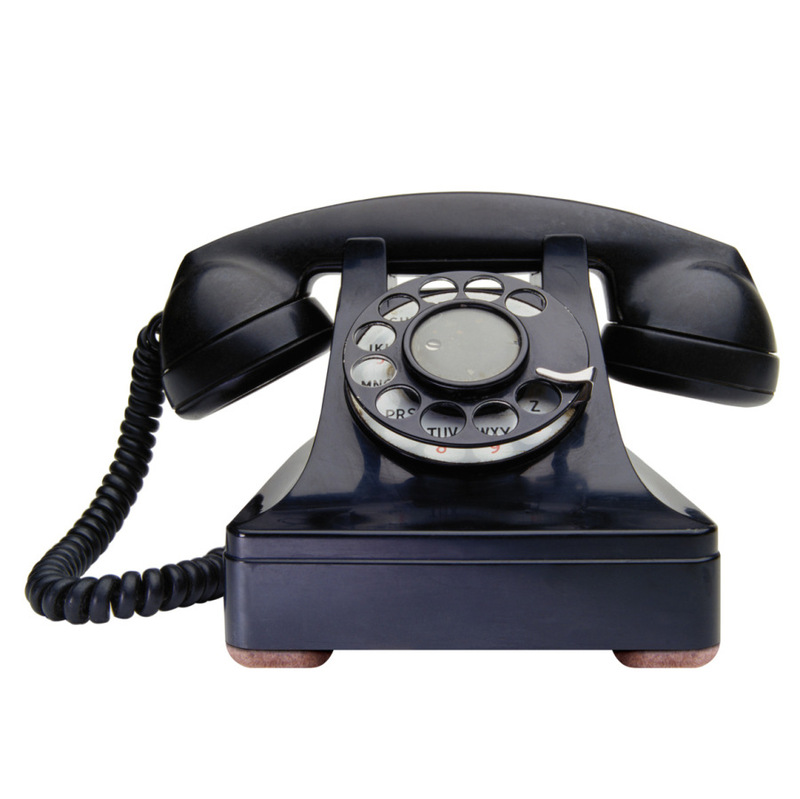 If you are unable to speak directly with the agency staff of your choice, please leave a message and they will contact you as soon as possible. Messages are checked regularly. From Rt. 80 East bound, take exit 299 Tannersville, make right off exit ramp. Take to second stop light, turn left onto Rt 611 North. Take Rt. 611 North approximately 2.5 miles. Turn right at "MCTA Home of the Pocono Pony" sign. From Rt. 80 West bound, take exit 298 Scotrun, turn left onto Rt. 611 North. Take approximately 1 mile. Turn right at "MCTA Home of the Pocono Pony" sign. From Rt. 33 North bound, bare left onto Rt. 80 West at Bartonsville. Take Rt. 80 West to exit 298 Scotrun, turn left onto Rt. 611 North. Take approximately 1 mile. Turn right at "MCTA Home of the Pocono Pony" sign. In the early 1970's, a transportation committee was formed through the Monroe County Chamber of Commerce, and in 1978, Monroe County Commissioners formed an exploratory commission to examine ways to obtain funding for a public bus route. At that time, it was determined that a public transportation authority would have to be developed in order to receive state and federal funding. 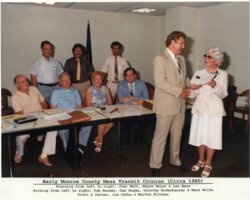 In the fall of 1979, the County Commissioners of Monroe County appointed 7 members to form a board of directors at Monroe County Transit Authority. Martha Kitchen who served as Chairman of the Transportation Committee was also elected as Chairman of the new Monroe County Transportation Authority. The authority started its operation with a 20 passenger 1947 GMC Transit Bus, an executive director and one administrative assistant. Mr. Phillip Gerghardt, of Pocono Auto, was subcontracted to maintain the operations for the transit authority at that time. On Monday, October 15th 1979, the first route began at 7:00 am at the corner of Bridge and Miller Sts. in Stroudsburg. The first route was referred to as the "Inter-boro Loop" which primarily served the Stroudsburg and East Stroudsburg business districts, the Stroud Mall, "East Stroudsburg State College," and "Pocono Hospital." The fare was $.25. On November 24, 1979, Saturday service was introduced for the holiday rush. Around the 1st of February in 1980, a second route, the "Fifth St. Loop," was introduced. It served downtown Stroudsburg, state agency offices on Phillips St. the East Stroudsburg industrial sector along Stokes Ave., and Eagle Valley Corners. The "Fifth St. Loop" connected with the "Inter-boro Loop." In 1983, the Authority purchased 4 new, 35 passenger Neoplan Transit Buses in the amount of $630,000.00 with federal and state funds. The additional buses extended service to 3 routes, including service to Delaware Water Gap Borough. In 1994, the Authority obtained a $1.4 million dollar grant to build its current facility in Scotrun. The facility was completed in 1998. It included a 6 vehicle repair bay, a three arm gantry bus wash bay and administration offices. In 1997, MCTA acquired the Shared Ride program from the Area Agency on Aging. This program provides curb to curb transportation services for seniors 65 or older. For the next 12 years, service was limited to certian days of the week, depending on where the customer lived. In 2006, MCTA through a grant from PennDOT, began providing Shared Ride service for Persons With Disabilities. This program has provided nearly 50,000 trips for enrolled invidividuals with disabilities in Monroe County who would have not otherwise have had access to public transportation. In 2006, the MCTA took on a new look and branded itself, "The Pocono Pony." 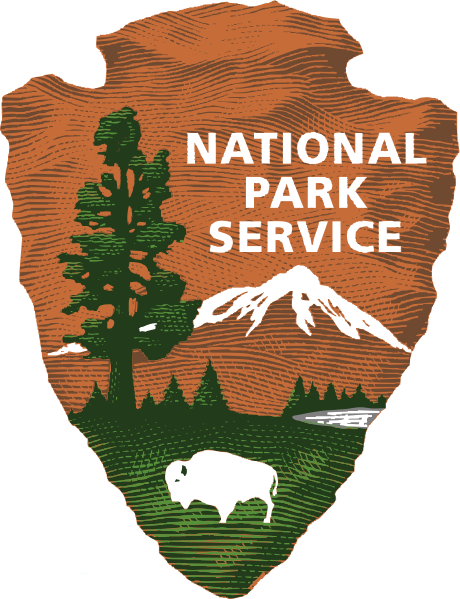 The new logo became a symbol for the lush green hills and the clean blue skies of the Pocono Mountains. MCTA, which started as a one bus show, has grown to a fleet of 16 public fixed route buses with 4 routes. As of November 2011, The Pocono Pony has a fleet of 31 Shared Ride vehicles that provide transportation under subsidized programs for seniors and people with special needs. Shared Ride offers transportation throughout all of Monroe County, as well as, regions in Allentown, Bethlehem, Easton, Wilkes-Barre and Scranton. In 2009, MCTA introduced four new Gillig brand buses to it's fixed route fleet. Two of the buses are of the newly styled 'Bus Rapid Transit' design. Sleek lines and an aerodynamic body harken the new modernist approach to bus design from Europe (the buses are USA designed and built). The two other buses are designed to replicate the old time trolleys of yesteryear, right to the brass bell. While they look great, they also have cutting edge hybrid electric diesel motor technology that uses energy generated when the bus applies its brakes to begin the initial acceleration after a stop. This techonology should reduce the amount of diesel fuel used compared to other non-hybrid vehicles. MCTA is leading the techological revolution with an automated fare collection system that uses smartcard technology to process and store fares and passes. This same system will be able to provide realitme stop prediction to internet saavy customers. 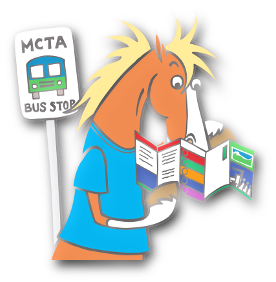 MCTA provides online tools to help passengers identify the real-time location of their bus. Shared ride customers are able to lookup their active trip for the day and find out the real-time estimated arrival of their vehicle to their location. 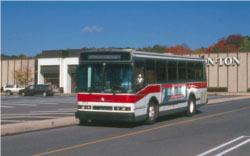 In 1983 MCTA was able purchase and run its first series of new buses. In 2006, MCTA rebranded its service to the Pocono Pony. A photo of our hybrid electric / diesel trolly - Martha (as in Martha Kitchen)- in December 2009.